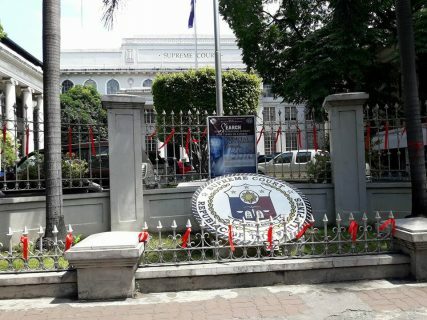 From the gates, the fences, and the walls of the Supreme Court Justice building, hanged with red ribbons all around its four corners, the place turned red on the eve of the Quo Warranto decision. The case was filed against Supreme Court Chief Justice Maria Lourdes Sereno to oust her in the position due to undeclared SALNs. The members of the SC were handedly hanged the ribbons as a sign of protest of their top magistrate.